Demers was born in 1956, in the small, rural community of Lunenburg, Massachusetts. 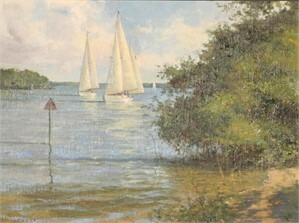 His interest in painting maritime subjects began while spending his summers on the coast of Maine near Boothbay Harbor After finishing an exemplary high school art program, he furthered his education at the School of the Worcester Art Museum, Worcester, MA, and the Massachusetts College of Art in Boston, MA Don's maritime experience came about as a crewmember aboard many traditional sailing vessels including schooners and square-riggers. He continues to be an avid sailor. His professional career began as an illustrator and expanded into the field of fine art. His illustrations can be found on many book covers and in national publications such as Reader's Digest, Sail Magazine, Field & Stream, Sports Afield, Yankee, and National Geographic. Demers' paintings have been featured in a number of publications including American Artist magazine, Artist magazine, Plein Air magazine, Fine Art Connoisseur , Art and Antiques, Yachting magazine, Nautical Quarterly, Nautical World, Offshore magazine, and Maine Boats and Harbors. His work has also been featured and discussed in a number of texts including Concordia Yawls, The First Fifty Years, by Elizabeth Meyer, Marine Painting and Yachts on Canvas, both authored by James Taylor, of Greenwich, England. Yacht Portraits published by Sheridan House, A Gallery of Marine Art, Rockport Publishers, an instructional textbook titled Marine Painting, Techniques of Modern Masters published by Watson Guptill and Bound for Blue Water written by J. Russell Jinishian and published by Greenwich Workshop. Demers' diversity has enabled him to apply his skills to clients ranging from American Airlines to the National Park Service. Various projects have included creating art for national television advertisements, educational television programming and designing art glass for Steuben. Demers' body of work has expanded to the study and creation of landscape painting. These works are created from subjects across the country and beyond, often in consort with other artists of similar inspiration. His landscape work has garnered him two awards at the Laguna Plein Air Invitational in Laguna Beach, California in 2001 and 2002. He has also received an award for his painting at the 2007 Crystal Cove Invitational sponsored by the Irvine Museum in Orange County, CA. Demers is a "Fellow" of the American Society of Marine Artists, an elected member of the Guild of Boston Artists, an elected member of the California Art Club, and a signature member of PAPA (Plein Air Painters of America). He has won a record seventeen awards at the Mystic International Marine Art Exhibition, Mystic, CT. including the Rudolph J. Schaefer Maritime Heritage Award in 2006. Demers' illustrations have been recognized by the Museum of American Illustration four times in their national competition representing the finest examples of work in the field. Recognized for his communication skills, Don conducts workshops for artists as well as producing instructional DVDs. He also lectures on his landscape and marine art. His audiences include museums, art associations, yacht clubs, historical societies and educational institutions. 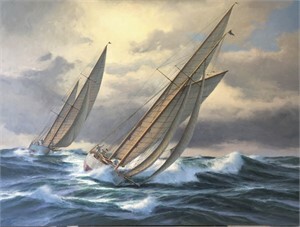 Don Demers paintings are published as limited edition prints through The Greenwich Workshop in Seymour, Connecticut. Demers was born in 1956, in the small, rural community of Lunenburg, Massachusetts. His interest in painting maritime subjects began while spending his summers on the coast of Maine near Boothbay Harbor After finishing an exemplary high school art program, he furthered his education at the School of the Worcester Art Museum, Worcester, MA, and the Massachusetts College of Art in Boston, MA Don's maritime experience came about as a crewmember aboard many traditional sailing vessels including schooners and square-riggers. He continues to be an avid sailor. His professional career began as an illustrator and expanded into the field of fine art. His illustrations can be found on many book covers and in national publications such as Reader's Digest, Sail Magazine, Field & Stream, Sports Afield, Yankee, and National Geographic. Demers' paintings have been featured in a number of publications including American Artist magazine, Artist magazine, Plein Air magazine, Fine Art Connoisseur , Art and Antiques, Yachting magazine, Nautical Quarterly, Nautical World, Offshore magazine, and Maine Boats and Harbors. His work has also been featured and discussed in a number of texts including Concordia Yawls, The First Fifty Years, by Elizabeth Meyer, Marine Painting and Yachts on Canvas, both authored by James Taylor, of Greenwich, England. Yacht Portraits published by Sheridan House, A Gallery of Marine Art, Rockport Publishers, an instructional textbook titled Marine Painting, Techniques of Modern Masters published by Watson Guptill and Bound for Blue Water written by J. Russell Jinishian and published by Greenwich Workshop. Demers' diversity has enabled him to apply his skills to clients ranging from American Airlines to the National Park Service. Various projects have included creating art for national television advertisements, educational television programming and designing art glass for Steuben. Demers' body of work has expanded to the study and creation of landscape painting. These works are created from subjects across the country and beyond, often in consort with other artists of similar inspiration. His landscape work has garnered him two awards at the Laguna Plein Air Invitational in Laguna Beach, California in 2001 and 2002. He has also received an award for his painting at the 2007 Crystal Cove Invitational sponsored by the Irvine Museum in Orange County, CA. Demers is a "Fellow" of the American Society of Marine Artists, an elected member of the Guild of Boston Artists, an elected member of the California Art Club, and a signature member of PAPA (Plein Air Painters of America). He has won a record seventeen awards at the Mystic International Marine Art Exhibition, Mystic, CT. including the Rudolph J. Schaefer Maritime Heritage Award in 2006. Demers' illustrations have been recognized by the Museum of American Illustration four times in their national competition representing the finest examples of work in the field. Recognized for his communication skills, Don conducts workshops for artists as well as producing instructional DVDs. He also lectures on his landscape and marine art. His audiences include museums, art associations, yacht clubs, historical societies and educational institutions. 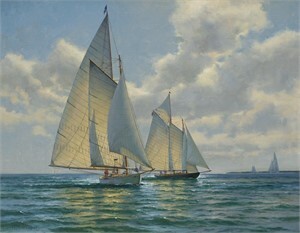 Don Demers paintings are published as limited edition prints through The Greenwich Workshop in Seymour, Connecticut.